Organic Norms (IFOAM) | Infonet Biovision Home. Infonet-Biovision promotes the IFOAM Principles for animal health and welfare management as they contain guidelines for humane treatment of livestock. International standards are also used to help countries set their own standards, which take into account different farming systems. Many countries have an organic standards authority which lays down national standards and awards a symbol to farms which have followed the standards. This symbol then allows farmers to market certified organic produce. This is important, as it ensures that people know that the food which they buy is organic. Organic agriculture is a production system that sustains the health of soils, animals, ecosystems and people. It relies on ecological processes, biodiversity and cycles adapted to local conditions, rather than the use of inputs with adverse effects. Organic agriculture combines tradition, innovation and science to benefit the shared environment and promote fair relationships and a good quality of life for all involved. Thus, organic farming is based on a number of objectives and principles designed to minimise the human impact on the environment, while ensuring the agricultural systems operate as naturally as possible. Furthermore, organic farming is also part of a larger supply chain, which encompasses food processing, distribution and retailing sectors (Lampkin, 1990; IFOAM, 2006). What products are covered by the Standard System? The IFOAM norms cover a wide range of products including crop production, livestock, wild products, processing, fiber processing, and aquaculture among others. Strict limits on chemical synthetic pesticide, herbicide and synthetic fertiliser use, livestock antibiotics and hormones, food additives and processing aids and other inputs. Taking advantage of on-site resources, such as livestock manure for fertiliser or feed produced on the farm. Choosing plant and animal species that are resistant to diseases and adapted to local conditions. Raising livestock in free-range, open-air systems and providing them with organic feed. There is a range of standards regulating the management, shedding, feeding, veterinary treatment, breeding, purchase, transport, and slaughter of farm animals in detail. Some of the most important standard requirements are listed on the illustration below. Organic animal husbandry means not only feeding organic food and avoiding synthetic food additives, but also putting a focus on satisfying the various needs of the farm animals. Good health and welfare of the animals are among the main objectives. Suffering due to mutilations, permanent tethering or isolation of herd animals must be avoided. For various reasons, landless animal husbandry (i.e. fodder purchased from outside the farm, no grazing land) is not permitted in organic farming. The operator shall ensure that the environment, the facilities, stocking density and flock/herd size provides for the behavioral needs of the animals. 6. Herd animals shall not be kept in isolation from other animals of the same species. This provision does not apply to small herds of mostly self-sufficient production. Operators may isolate male animals, sick animals and those about to give birth. Read more practical aspects in the respective Chapters on Welfare & Health Promotion, Husbandry (Feeding, Breeding, Housing), Integrating animals to the farm, Human-animal relations and many more. The principles are to be used as a whole. They are composed as ethical principles to inspire action. In many other places on this website, you can find many details, suggestions and recommendations leading to action. The IFOAM principles are guiding this, and below an extract is shown with particular focus on animals and creating living conditions for them according to the principles. The health of individuals and communities cannot be separated from the health of ecosystems - healthy soils produce healthy crops that foster the health of animals and people. Health is the wholeness and integrity of living systems. Health is not simply the absence of illness. It is the maintenance of physical, mental, social and ecological well-being. Immunity, resilience and ability to regenerate are key characteristics of health. The role of organic agriculture, whether in farming, processing, distribution, or consumption, is to sustain and enhance the health of ecosystems and organisms on all levels. Organic agriculture is closely linked to living ecological systems. Organic farming, pastoral and wild harvest systems should fit the cycles and ecological balances in nature. These cycles are universal but their operation is site-specific. Organic management must be adapted to local conditions, ecology, culture and scale. Production must be based on ecological processes, and recycling. This emphasizes that animals should be part of harmonic systems where there is feed enough, and where they are part of a farm and contribute to the farm with their manure. Inputs should be reduced by reuse, recycling and efficient management of materials and energy in order to maintain and improve environmental quality and conserve resources. In relation to animal health and welfare, this principle also emphasizes the importance of allowing the animals to meet their natural needs. The harmony with the environment in an ecological system also implies that they live according to their nature, as far as we can understand this with the domestic animals and the environments which we have today. Natural and environmental resources that are used for production and consumption should be managed in a way that is socially and ecologically just and should be held in trust for future generations. Organic agriculture is a living and dynamic system that responds to internal and external demands and conditions. Care is about never taking the risk of jeopardizing health, balance, harmony and well-being. Given the incomplete understanding of ecosystems and agriculture, care must be taken. This principle states that precaution and responsibility are the key concerns in management, development and technology choices in organic agriculture. Animals are sentient beings, and they should be respected as such. They have natural needs, and these natural needs should be met. When allowing them to meet their natural needs, we practice the principle of precaution towards the animals: our knowledge about what they need may be incomplete, but we let them guide us when we allow them as much freedom as possible to perform their natural behavior and meet their needs. We learn, and we build up knowledge based on science, experience and wisdom exchanged from others, and gathered through our observations. Intervene whenever necessary, if something is wrong or risky for the animals, but do not intervene when things are fine. Mutilations are all forms of physical injuries done to the living body, which degrades the appearance or functions, and which have no healing purpose. 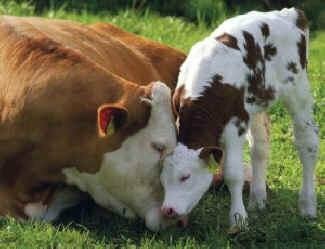 In livestock farming, animals are most often subjected to mutilations because it decreases the damages, which they can make to each other when they are confined or kept. Under confined conditions they may not have space enough to perform their species specific behavior. The general principle for organic animal farming according to IFOAM is that 'Organic farming respects the animal's distinctive characteristics'. This means that animals should be intact, and their integrity should be kept. Surgical treatments should only be used for reasons of safety, mitigation of suffering and the health and welfare of the livestock. The first recommendation stresses that damages, which animals can do to each other, should be prevented by selecting animals (species and breeds) which have minimum risks. For example, some sheep have very loose and folded skin, which gives high risk of attacks from flies and maggot infestation. These sheep are therefore subjected to a practice where their skin is cut so that it is less folded - this is called 'mulesing'. This is obviously painful and in organic farming and this breed should be avoided in organic farming. Surprisingly, mulesing is still allowed according to the IFOAM standards, until 31st December 2015. The second and third recommendation is tricky, because this is exactly the arguments which are used to justify mutilations e.g. in factory farming. Mutilations keep suffering (in terms of damages to the animals), to a minimum in many farms where the conditions are not animal friendly. In organic farming we have to combine this recommendation with the other norms: 'it is to keep suffering to a minimum even under conditions where everything possible is done with regard to breed and surroundings'. Mulesing only for breeds that require mulesing (permitted until Dec. 31st 2013). In research and practice, solutions are constantly searched for to avoid mutilations, including the above mentioned. How can we judge whether a mutilation is severe or less severe? A mutilation is always severe, because it is about doing physical injuries. But some are very severe, because they have long lasting impact on the animal, maybe even lifelong impact. A castration is a mutilation which severely diminishes or removes all sexual desires and behavior the rest of the animal's life - that is severe! Is the animal welfare or integrity affected permanently? If the answer to this is yes, then it is a severe mutilation. As explained above, castrations fall into this category. Beak trimming of poultry can lead to permanent pain when pecking for feed on the ground, and are as such a severe mutilation, because searching for feed is a profound part of poultry's normal behavior. Dehorning or disbudding of cattle can change the power relations in a group of cows, but they still form a hierarchy, so by some it is not regarded as very severe, but by others it is, because it changes the cow's 'zone of tolerance', that is, the zone which she will accept others before a confrontation. This makes it possible for humans to keep more cows in smaller space. Is the mutilation necessary for animal related purposes? Does the animal profit from it? A caesarian can be regarded as a mutilation which the animal benefits from, if it is necessary for the survival of its offspring. Most caesarians are result of a 'normal animal' having difficulties in giving birth in a case. There are some breeds which are very likely to require a caesarian when giving birth; they should be avoided in organic farming because it is fair to avoid mutilations when something can be prevented through the choice of breed or farming system. We always have to ask ourselves whether the mutilation can be avoided by removing any underlying cause? Is the mutilation necessary to meet some human related aims? As stated above, most mutilations are regarded as 'necessary' for human use purposes. The question is whether we can avoid those mutilations by meeting the needs of animals - then we should do so in organic farming! One example of this could be pigs: pigs generally attack each other if they are frustrated and are not sufficiently stimulated, and e.g. bite in each other's tails. This could be prevented by giving them conditions where their curiosity could be challenged, e.g. space and opportunities to root in some material. But, some farmers rather solve it by cutting off the tail in a young age, and then the other pigs can obviously not bite it off. Many pigs get both their tail and teeth cut off. What will happen if the mutilation is not done? Which alternatives do we have? This is a part of the questions above - and it could be decisive for keeping a practice of mutilation. For example, if avoiding castration, the consequence could be that male animals cannot be kept in a group without constantly fighting, or mating with their close relatives among the females. Alternative housing conditions etc. can be considered, but when it is 'normal practice', a complete re-think of the whole farm is a big change. But basically it should always be asked whether there are alternatives which make the mutilations unnecessary? Can changes in animal husbandry help? What is accepted by society? This is really not a criteria for whether a mutilation is acceptable or not - sometimes people or 'society' accept horrible things, just because they are used to it, and it has turned into a habit. It is, though, thought stimulating to think about what is perceived as 'normal' and compare it to the above criteria. Below a list of different types of mutilations, most of which are prohibited in organic farming. Alternatives are discussed. Beaktrimming. Beak trimming (sometimes referred to as beak treatment) is a mutilation where part of the upper and lower beak is removed. This cause pain and stress and influences the behavior on long-term basis. Beak trimming is applied to avoid the consequences of excessive pecking behavior. Pecking is a natural behavior of poultry. In commercial poultry keeping it can end up in feather pecking and cannibalism, which causes a lot of damage/pain to a bird and can lead to high mortality. Not only laying hens and layer and broiler parents are beak trimmed but also turkeys (the upper beak). The trimming can be done with a hot blade or with infrared device at an age from the day they are hatched up to 5 weeks of age. This mutilation severely affects the integrity of the animals and should not be used in organic farming. Castration. Castration is removing the testicles of male animals (stallions, boars, bucks, rams). It is done to reduce inbreeding and to achieve well-distributed fat in beef animals. In pigs it is done to prevent pork to smell. It is also done to get easier to handle animals in stallions. It is painful and causes stress and influences the behavior severely, because castrated males cannot show sexual behavior. The least painful method is recommended in organic production systems. Castration is commonly practiced in organic farming, and research is done to find solutions to avoid it, because it severely affects the animal's sexual behavior. Despurring. Despurring is stopping the growth of the spurs of cockerels immediately after hatching by pushing the spurs against a hot iron. Despurring causes pain and stress while the treatment is performed. This mutilation is executed because spurs of adult cockerels can cause deep wounds on the thighs of the hens the mate with. This mutilation is not explicitly mentioned as accepted in the IFOAM norms, and as such regarded as not possible. If having the mentioned problems, the solution can partly be favoring breeds with less need for this. Dubbing. Dubbing is cutting part of the combs of cockerels with a small scissor to prevent combs to grow too large. When cockerels have too large combs there vision is limited what results in lower fertility. This is unacceptable in organic farming, and can be solved by choosing the right breeds. Disbudding. Disbudding is taking away the horns of cattle, goats and sheep at a young age. It is done by pushing a hot iron on the horn tip so it will not grow again. In some countries disbudding in organic is allowed. A local anesthetic must be used to prevent suffering. The hair should be clip off around the horn area to reach it as precise as possible. Sometimes acid paste is used to disbud but that should not be done because it is less precise and is therefore more painful. Pain treatment should be applied, and the mutilation should only be done if pain treatment can be given, and the conditions (including the breed etc.) makes it impossible to keep horned animals. Much can be solved by giving the cows space and manage them gently and without stressing them, and by selecting the right breed. Dehorning. Dehorning is removing the horns of cattle, goat and sheep at an older age by cutting or sawing them. It can be allowed inorganic animal husbandry only if animal suffering is minimized and anesthetics are used. Same as above, except that the process of dehorning instead of debudding is a painful and serious operation, which can severely affect the animal. Mulesing. Mulesing is stripping of part of the skin of the hind part of sheep to prevent it for having parasites and maggots under the skin. It is completely forbidden in organic since 31st of December 2015. Breeds which are prone to this should simply be avoided in organic farming. Nose ringing. Nose ringing with a ring through the nose is done to have better control over bulls and boars but also to prevent animals from cross suckling. In some places it is forbidden to transport bulls unless they are noseringed, because that is the only possibility of handling them if they should panic or break free. It is painful when applied and it changes behavior. E.g. some nose ring sows and this make them graze instead of root. It can be allowed in organic animal husbandry, only if animal suffering is minimized and anesthetics are used. Pinioning. One or both wings are sometimes cut to prevent poultry from flying. This can be a very painful practice and should be avoided if it involves touching nerves, or causing bleeding. It can sometimes be done by just cutting tips or parts of the feathers, without bleeding. Removal of extra teats. If a heifer has more than 4 teats, remove the extra teat. This should be 2 to 3 weeks of age. We cut the extra teat carefully with a sharp pair of scissors and disinfect the scar with iodine. This is a mutilation which is particularly relevant when using milking machines. When hand milking it is not that necessary. Tail docking. Tail docking is amputating (part of) the tail of cattle, sheep and pigs to prevent diseases and in pigs, to prevent cannibalism. It is painful and stressful experience and it influences behavior chronically. In organic lambs it is allowed when animal suffering is minimized and anesthetics are used. In all other cases it is forbidden. Toe clipping. Clipping of toes breeder cockerels from broiler breeds is clipping the hind toe (sometime two toes) with a hot blade or wire immediately after hatching. It is painful and causes stress and it could cause chronic pain. The mutilation is done to prevent injuries of the hens caused during mating. Brandmarking for identification. For record keeping, it is practical to mark animals just after birth. As discussed in the section of record keeping identification can be done by having certain characteristics, such as color patterns or hair whorls registered. By giving animals a colored number or stripe on the skin, it can be identified for a short period, but then the marking should be repeated. Collars or bands around the feet can fall off. For these reasons, permanent identification methods are used. Ear tagging, tattooing and branding can be used. Clipping part of ear. It is common practice for donkey owners, particular in rural areas and where donkeys live in large herds, to mark their animals. This is often done by cutting patterns in their ears or, in the worst case, to cut the ears off altogether. This method of brand marking should be avoided at all costs. Ear notching. Ear notching is putting a mark in the ear of animals with a pin through a hole in the ear. Freezebranding. Freezebranding is marking animals on the skin with an iron, cooled down in fluent nitrogen (-85oC). It causes stress while performed and pain because the pigment in the skin is destroyed. It recovers after a few days and dos not give chronic pain. Hot branding. Hot branding is putting a number or other mark with a hot iron in the skin of animals (which is extremely painful). It does not cause chronic pain. It is common practice for donkey owners, particular in rural areas and where donkeys live in large herds, to mark their animals. It is acceptable because it is probably the only way rural donkey owners can identifying their animals. Tattooing. Tattooing is making a wound where ink is applied, into animals skin of the ears, lips or tong.